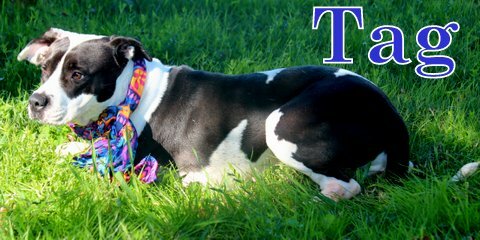 ​Tag is a honey of a dog and wants nothing more than to love you and be loved in return. We believe she was badly abused at some point. She is having a hard time trusting human. She does this to your hands as well if she perceives them as a threat. This leads us to believe that at some point someone was not kind to this gentle soul. We are working on this with her to teach her that feet and hands won't hurt her. For this reason I do not believe she needs to be in a home with children. She's sweet as pie. Loves to play. Wants to be with you and she will talk to you by huffing and puffing until you pay attention to her! Hahah. She is just the kindest little lady. She wants nothing more than to be with you. She gets along with the other dogs in her boarding but she's slow to warm up. With slow introductions she does fine and wants to play. She will require a calm, patient home that will meet her needs. She is crate, leash, and she loves to go for car rides. I was found inside a private property a ranch which the owner was not sure how I was able to get inside. I had been living in front of their porch for a month or so I think. I was hungry cold shivering in front of their porch. The owner wants me out of their property so they contact a few rescue groups to come and take me away. And my next choice will be a shelter. A very nice lady hears about my situation she contacted several rescue group to help me. They also realize I was about to have my pups. She immediately tries to find help for me and my unborn pups. She contacted these ladies call themselves Angels Four Paws. Angels Four Paws are truly my earth angels, as they came to my rescue. If it was not for these angels my pups and I will not be here today. I have been spay, completely vetted and microchip, so I am ready to start my new life. Even thought I am in Houston Texas it will only take a few hours for me to be with you and become a part of your family. I have been with Angels Four Paw for over a year now and it is time for me to find my forever family.